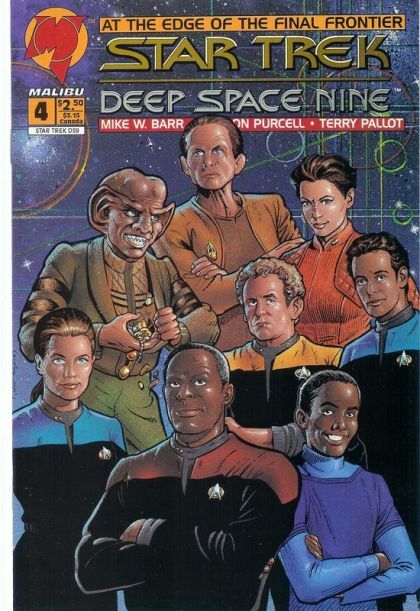 Dax and Bashir are found by a ship with passengers that have things to hide. They bring them back to the station, and it's soon clear that these are slaves seeking escape, who only ask for asylum when their non-existant cover story is blown. O'Brien makes the inaccurate comment that the Federation is in charge of DS9 and the prime directive applies: the pilot episode established that it's a Bajoran station, and the Federation presence is merely to assist with administration. The "owners" of the slaves show up before the debate is finished, and Sisko has a well written scene in which he assigns each member of the command crew a task designed to buy time and slow the entry onto the station. One of the slaves is granted freedom as punishment when he loses his possessions to Quark's dabo table, while Ben Sisko meets with the leaders on both sides to try and come to an agreement. Dax discovers the home world of the slaves on this side of the wormhole. The free gambler sabotages a craft because he hates freedom, while others steal a runabout and try to travel through the wormhole, intentionally or accidentally risking destruction of the runabout and the wormhole itself.